We met exactly one year before our wedding date, at a restaurant in downtown Chicago. We decided to get married about three months later. As soon as we met, we knew we were made for each other. I came home from work on a Friday and found Jay in my condo down on his knees with a beautiful ring. There was a beautiful sign, romantic decorations, and even all new furniture everywhere. He and his friends worked all day to truly surprise me, and it was amazing. With Jay and I living in Chicago and the wedding being planned in Florida, we faced a lot of challenges surrounding the planning of a wedding remotely. It all worked out well though—with the help of e-mail and my large and supportive family in Florida who did the bulk of the work. We did not have a consultant, and instead, my parents did a lot and had a large volunteer committee that helped work through every detail. It was truly a community effort and we are very grateful to everyone that assisted. I grew up in South Florida and wanted to get married there— it was a great experience to be surrounded by everyone that I was raised along with in the community. Plus the weather was amazing – way better than in Chicago! The Marriott Heron Bay was not only a beautiful venue, but it was convenient and allowed us to have all of our events in one location. I bought my wedding outfit from Asopalav, a store in Ahmedabad, India. We went to India in November to go shopping and bought all of our clothes and accessories during that trip. The selection was wonderful – the trip was well worth it. My saree was a very traditional red and white, and I custom designed all of my jewelry to match from a small shop in Nadiad, Gujarat. 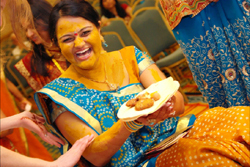 There were three main events for which to get ready – garba, wedding, and reception. I have to give all the credit for all my hair and makeup to my beautician, Anju Thakkar. She was absolutely wonderful. She was patient and artistic, and she paid such attention to every single detail. For the garba, she designed my hair into a long, traditional braid called a “chotlo” that was absolutely stunning, surrounded by fresh flowers. We had many flower girls and boys walking down the aisle — all of nieces, nephews, and cousins. The older girls came out doing a dance, the younger girls carried flowers, and the boys carried roses and of course the ring. Jay wore a custom designed Shirvani at the wedding that was embroidered to match my outfit exactly. At the reception he wore a tuxedo, as did all of the men in the wedding party. We chose to have matching tux designs, but everyone chose their own vest color to match their own personality. 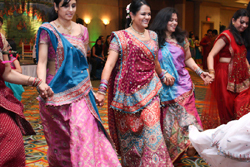 For the garba, we chose a multi-colored theme. All the tables and décor had bright, varied colors. Nilu and Jay’s outfits were also multicolor. 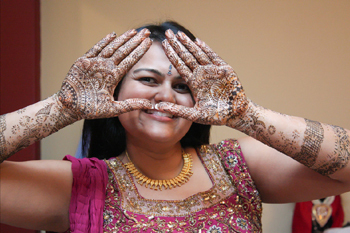 Our mendhi celebrations took place at home — my parents, brother, and sister-in-law did a wonderful job hosting. They have a breathtaking home, and they built a tent in the backyard beside the pool. Rupal, my sister-in-law, did many of the decorations herself and Rakesh Anand also helped decorate the house — there were candles, lights, and many traditional decorations made of red bandani. We invited the groom’s side over as well, and it was a great occasion for the families to mingle and get to know each other. On the morning of our special day, the wedding ceremony took place at the Marriott’s convention center. The barat was one of the best parts of the wedding — the groom’s side launched tons of fireworks, and then came down a street that was lined with large palm trees against the backdrop of the golf course. Once inside, traditional red and white decorations were displayed throughout the hall with a large, gold and white mandap. In our family, the bride’s maternal uncle traditionally brings her down the aisle. Unfortunately, my “mama” was not granted a visa. Therefore, two very special people in my life walked me down the aisle in his place — my brother, Anil, and my sister-in-law, Rupal. One of the most memorable moments for me was when my brother continually held my arm tightly and whispered in my ear halfway down the aisle, “Take it all in Nilu. Take it in.” That was the best advice anybody could have given me. Our DJ, Satbir Singh from Ace DJ, did a great job with the music at the garba, wedding, and reception. He had an outrageous traveling cart at the barat and you could hear the music throughout the whole hotel – it was awesome! I was sitting in my hotel room getting ready, and I could hear every bit of music outside with my balcony door open — it was so cool, I felt like I was in the middle of a Bollywood movie. The dhol player he brought along just added a wonderful kick to the atmosphere. Jay arrived at the wedding venue in a huge white convertible Bentley that was decorated beautifully with red and white flower strands. Wow, was it breathtaking! Traditional, yet contemporary. I felt like a princess being driven away in it after the wedding. 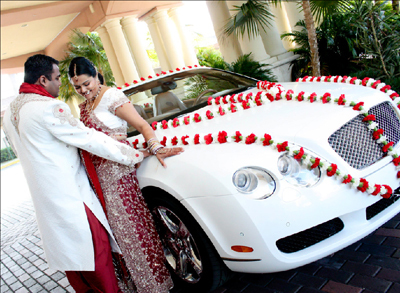 Two companies took care of photography and videography – Spectacle Photo located in Orlando, and Anand Photo and Video located in South Florida. Both were great. Rich Johnson from Spectacle Photo was one of the most memorable people we have ever met. He is very talented, fun, and an extremely creative photographer. A few months before the wedding, he did our engagement shots at Morikami Park in Delray Beach and they were also spectacular. The decorations for the reception were designed to match my outfit, which was teal and gold. The stage backdrop and tables matched, and the centerpieces were large glass vases filled with water and orchids. We had four speeches — all of which were memorable. My brother spoke, and so did Jay’s brother, Sandip. 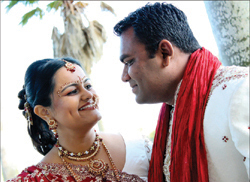 Both had lots of memories to share about Nilu and Jay’s childhood and path before they met each other. My friends from college spoke and so did Jay’s best friend. My frieds gave Jay some wise pieces of advice. Jay’s friends always have some hilarious stories— life with Jay never has a dull moment. The cake was designed by Michelle Crooks at Publix. 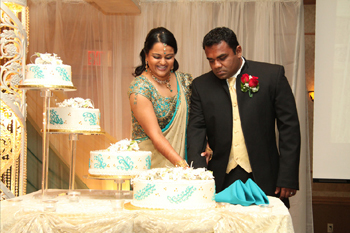 She did a great job—she even custom mixed the icing to exactly match my outfit – all based on a cloth cutting. The cake was four tiers, and each tier was on a separate stand. Sugar flowers and separate stands were used to preserve the beauty and taste of the cake. The favors we gave out at the wedding surrounded our love of dance. We gave out bags with payal in them for the girls, and also a CD with our favorite songs on them. We also tied a quote to the top of the bag, which had to do with dance and the bond of love. My advice is to delegate and trust. I had such a wonderful time at the entire wedding, and that was because we delegated every single detail to our close friends and family. When the weekend came along, all that was left to do was have a great time with everyone who came. 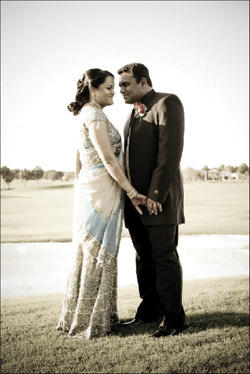 Jay’s advice— if you are planning a wedding, just call Nilu’s dad, Natubhai Patel from Coral Springs. Throughout the wedding planning process, I kept dreaming of the moment when I’d be walking down the aisle. Over and over everyday, I’d dream of that moment. I must say, the real thing was just as perfect as my dreams. When I was getting ready for the reception, my beautiful bangles broke! I loved them and they matched my teal and gold dress perfectly. However, don’t fear because Anju Auntie was there. She didn’t even flinch—she remained calm, just whipped out her needle and thread and somehow fixed my bangles in 15 minutes. Wow!